Largest US food distributor declares force majeure on fresh fruit and vegetables due to "devastating" freeze of "unprecedented magnitude"
Sysco, the largest wholesale food distributor in the US and primary supplier to most supermarket chains, has declared force majeure (the "act of God" clause) that allows suspension of contracted prices and supply of fresh fruit and vegetables due to the "unprecedented magnitude" of "devastating" and "extreme freezing temperatures" in a "very broad section of major growing regions in Mexico." 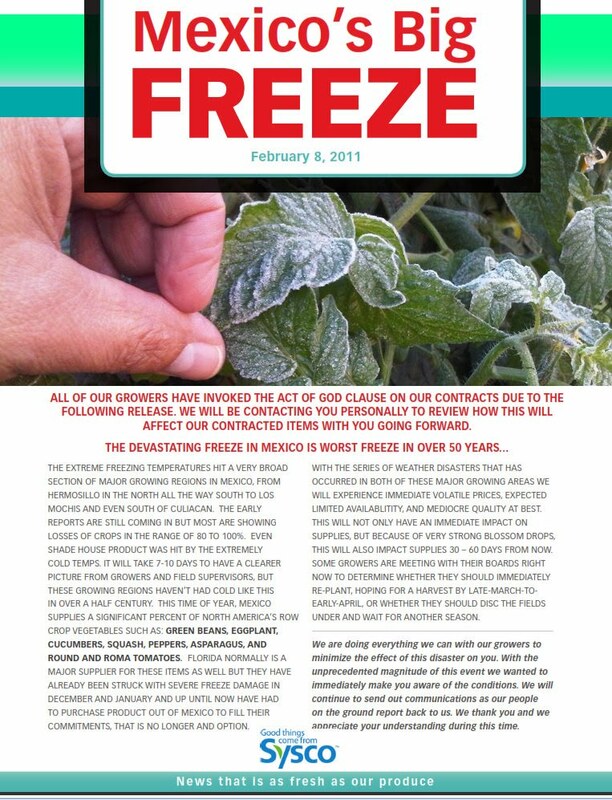 Sysco also reports "Florida is normally a major supplier for these items as well, but they have already been struck with severe freeze damage in December and January and up until now have had to purchase product out of Mexico to fill their commitments, that is no longer an option." THE EXTREME FREEZING TEMPERATURES HIT A VERY BROAD SECTION OF MAJOR GROWING REGIONS IN MEXICO, FROM HERMOSILLO IN THE NORTH ALL THE WAY SOUTH TO LOS MOCHIS AND EVEN SOUTH OF CULIACAN. THE EARLY REPORTS ARE STILL COMING IN BUT MOST ARE SHOWING LOSSES OF CROPS IN THE RANGE OF 80 TO 100%. EVEN SHADE HOUSE PRODUCT WAS HIT BY THE EXTREMELY COLD TEMPS. IT WILL TAKE 7-10 DAYS TO HAVE A CLEARER PICTURE FROM GROWERS AND FIELD SUPERVISORS, BUT THESE GROWING REGIONS HAVEN’T HAD COLD LIKE THIS IN OVER A HALF CENTURY. THIS TIME OF YEAR, MEXICO SUPPLIES A SIGNIFICANT PERCENT OF NORTH AMERICA’S ROW CROP VEGETABLES SUCH AS: GREEN BEANS, EGGPLANT, CUCUMBERS, SQUASH, PEPPERS, ASPARAGUS, AND ROUND AND ROMA TOMATOES. FLORIDA NORMALLY IS A MAJOR SUPPLIER FOR THESE ITEMS AS WELL BUT THEY HAVE ALREADY BEEN STRUCK WITH SEVERE FREEZE DAMAGE IN DECEMBER AND JANUARY AND UP UNTIL NOW HAVE HAD TO PURCHASE PRODUCT OUT OF MEXICO TO FILL THEIR COMMITMENTS, THAT IS NO LONGER AND OPTION. WITH THE SERIES OF WEATHER DISASTERS THAT HAS OCCURRED IN BOTH OF THESE MAJOR GROWING AREAS WE WILL EXPERIENCE IMMEDIATE VOLATILE PRICES, EXPECTED LIMITED AVAILABLITITY, AND MEDIOCRE QUALITY AT BEST. THIS WILL NOT ONLY HAVE AN IMMEDIATE IMPACT ON SUPPLIES, BUT BECAUSE OF VERY STRONG BLOSSOM DROPS, THIS WILL ALSO IMPACT SUPPLIES 30 – 60 DAYS FROM NOW. SOME GROWERS ARE MEETING WITH THEIR BOARDS RIGHT NOW TO DETERMINE WHETHER THEY SHOULD IMMEDIATELY RE-PLANT, HOPING FOR A HARVEST BY LATE-MARCH-TO- EARLY-APRIL, OR WHETHER THEY SHOULD DISC THE FIELDS UNDER AND WAIT FOR ANOTHER SEASON. We are doing everything we can with our growers to minimize the effect of this disaster on you. With the unprecedented magnitude of this event we wanted to immediately make you aware of the conditions. We will continue to send out communications as our people on the ground report back to us. We thank you and we appreciate your understanding during this time.